The hip, The hop and the happening....what have we been up to?? What have we been up to in the ever-busy world of events?! We are very blessed to have been able to keep ourselves nice and busy during the past while, collaborating with some of Durban’s best event companies in some epic displays, working some floral magic for weddings, and providing some high-end corporates with start to finish event solutions, to name a few. But being blessed is not all about luck, sitting and waiting for the next email alert in your inbox or the next client to call you up. We are a firm believer of constantly bringing in fresh ideas and providing out the box concepts and décor elements that we can market and sell. Staying in touch with our clients, knowing their needs, or just being able to provide something different to new or once off clients, is key to moving forward and ensuring our core business is constantly kept busy and challenged. That and constantly researching up and coming trends, new ideas and concepts and trying to push the envelope in the décor industry in South Africa. We have been manufacturing new items, re-purposing old ones, and bringing in new tech ideas which could have a massive effect on the products offerings to our clients…. So, what exactly have we been up to??!! Well here are a few standouts of late…..
Whilst this is no new idea at all, we have now manufacture ourselves a stunning 2.5m diameter self-standing arch, ideal for weddings or entrance ways, which we were able to fully dress and flower on its’ first hire. A wedding up Durban’s North Coast saw the arch being utilised for a wedding ceremony, a job that saw Functions for Africa collaborate with Alison’s Flowers, producing a magical scene for the bride and groom. Approximately 800 stems of flowers adorned the arch, along with greenery, providing a beautiful backdrop for the couple’s ceremony. Another great collaboration of late, was one with The Creativity Lab, who provided an amazing suspended umbrella concept. The display has been used as a marketing tool for Umhlanga’s Granada Square and was installed on Spring Day, in conjunction with their Health and Wellness Expo. An array of coloured umbrellas was suspended over a portion of the centre’s courtyard, and looks fantastic. This last week saw the SADC Conference being held at the Fairmont Zimbali Hotel and resort. We were fortunate enough to be involved with two of the evenings events, the first on the Monday evening, which was a simple décor setup, utilising cocktail furniture, a lounge area, some staging and lighting. A very simple setup but with loads of effect, provided the guests with a classy but casual ambience for the evenings dinner and entertainment. Huawei was the host and sponsor for the Thursday’s gala dinner at the ever popular Ayoba Grill, situated inside Zimbali. 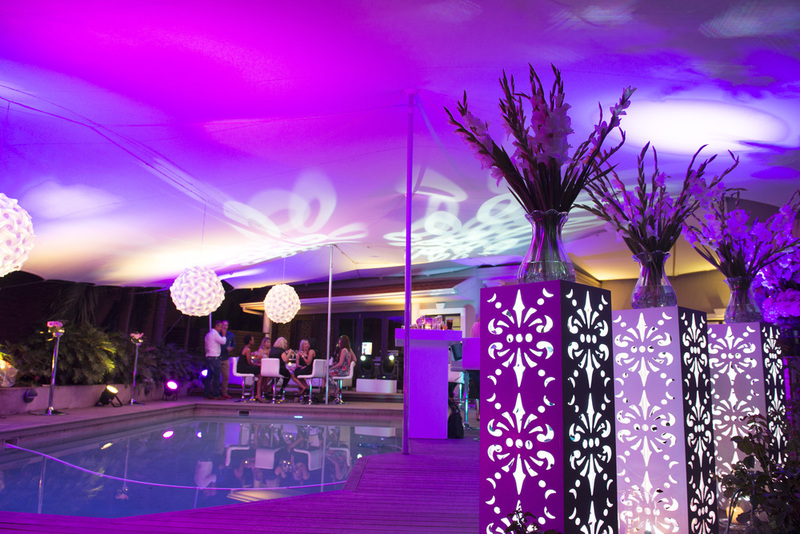 The poolside restaurant and bar is a picturesque venue nestled inside the tropical landscape of the Zimbali resort. The gala dinner was a seated affair, with round tables elegantly dressed and placed under a stretch tent, all poolside of course. Between the overhead bulb lighting in the tent to the colourwash of the balance of the venue…..night time fell and saw the venue transformed into a gleamy array of colours and ambience. Our dedicated technical team setup stage across the pool, allowing our DJ and band to perform to the guests over a glistening clear pool, providing a magical experience. Functions for Africa also brought in a crew of traditional African dancers which as usual wowed the guests adding another focal element to the evening. Being a part of these events is always so rewarding, and getting to enjoy in the success of such this evening with both local and international guests, was no exception. We have of course been involved in some other events, some smaller but just as exciting, some on a smaller scale or involvement. So please be sure to check out and follow us on our social media platforms, Facebook and Instagram and never hesitate to contact us should you need advice, concepts, décor and hiring. No matter how big or small, this is what we do! On 18th March 2017, Mpumi, along with close friends and family, celebrated her baby bump with an intimate baby shower. The casual, but very classy lunch was held at their Durban North residence. The simple, but extremely elegant and sophisticated look and feel that Mpumi's family chose for her for the day, was a perfect reflection on the style and sophistication yet down to earth manner radiated by the family. We opted to keep the decor simple, with focus drawn to the guests tables and buffets, providing elegant and detailed focal areas, rather than add too much to an already beautiful setting. Whites and grey's played beautiful contrast to the lush garden greenery and clear shimmer off the family's stunning infinity pool. We used our stunning grey and white printed tablecloths on the guest tables, along with crisp white Wimbledon chairs. White roses, baby's breathe, Lisianthus and Snowdon's were elegantly arranged in clear glass vases down the center of the tables, along with white lanterns, one of Mpumi's favourite decor elements. 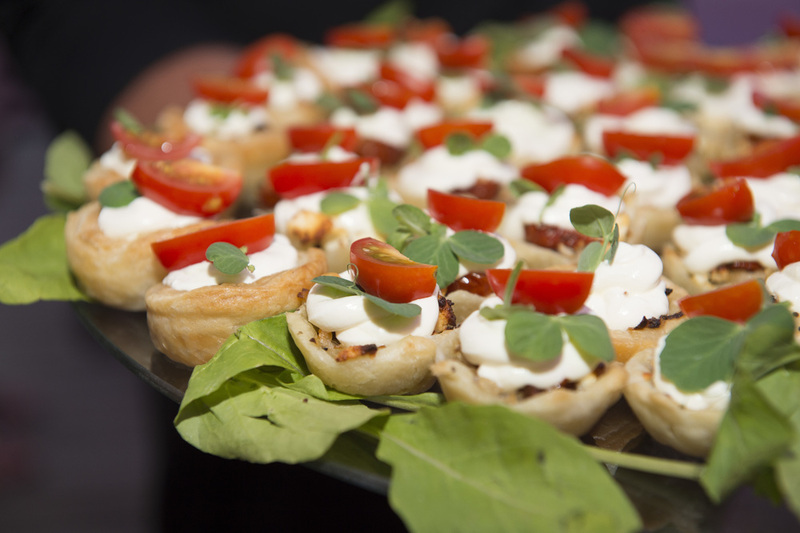 The guests were treated to an array of mouth-watering canapes, a harvest table second to none, decadent desserts and of course, chilled bubbly! A truly beautiful day for a beautiful Mom to be and her family!! For the first time since its inception, Functions for Africa was an exhibitor at the annual Decorex Decor fair in Durban. Following with the current trends and color-ways of greens and natural elements, Functions for Africa created a lush and inviting "forest", encompassing the natural warmth of guests' table setting. An array of wood, bark, greenary and flowers adorned the natural hand-made wood table, with touches of white and glass to add an element of class. Being Functions for Africa's first time at the exhibition, we were blown away with the response and engagement in our stand. The positive comments and interest from fair goers was fantastic, and made for an extremely fun and memorable event. To top off such an awesome exhibition week for us, we were awarded with the Best Decor stand of Decorex Durban 2017.......WOW!! We are extremely proud of our team, and honored to have been a part of this years' event. We would like to thank everyone who supported and are very greatful and thankful for our award!! Thank you Decorex Durban 2017!! Functions for Africa hot off the press! So, although many of you will cringe when reading this, the facts are real......we have 67 days until Christmas!! Yes ladies and gents, we said it....Christmas is almost upon us!! And as many people I'm sure will delve to the backs of their cupboards, garages or storerooms to resurrect the dodgy old Christmas tree, complete with multi-coloured fairy lights and a few strands of withered tinsel, a lot of us revel in the Christmas spirit and enjoy finding new ways to keep our houses and offices adorned with all things Christmas. So...what is trending, what is Christmas 2016 looking like decor wise. Vintage influenced kitsch brings in elements for those looking for a more contemporary feel. Bringing the vintage items to life and incorporating the feel of old Christmas with burgundies, deep reds and golds, along with the the "more is more" maximalistic approach is becoming a huge trend. Adorning the trees with old school decoupaged baubles, gold wrapped presents under the tree (a real tree we might add! ), and over the top garlands for mantles and doors are all hits for 2016. But if you are more a "new age" decorator....a bright and colourful hand crafted Christmas would be the way to go. Modern items revamped and adorned in bright colours, re-used in fun and creative ways is the trend for you. Revamped bottles for mantle and table decor, homemade baubles with whatever trinkets your cupboards and drawers offer up, decorated pine-cones that mimic the excited artworks of a school child. This trends is brilliant as it lets you personalise your decor and have fun...not to mention upcycling exsiting elements and items from your house! Well, I think after much absence, this blog post is well overdue! So, what’s been happening in the life of Functions for Africa and the eventing world. We have been a bit busy with many events and projects. The most magical event, and one that is still on the lips of many, was the unforgettable wedding of Brigitte and Kyle Hartley!! Many months of planning and concept development led to one of the most special and magical days! I think what makes weddings like these even more memorable, is the personal connection that we developed with the entire family. From meeting the Bride and Groom, and getting to know the rest of the family, we took this journey with them, and that is truly special. Despite the weathers’ best attempts, the day could not have gone off any better. Everything fell into place, and working with the best of the best in terms of Durban’s suppliers, it was no surprise. The ever popular culinary master Andrew Draper was at the helm of feeding the guests, and once again didn’t fail to blow everyone away. Both ceremony and reception were held at The Venue Fontana, a simply incredible family owned venue in the heart of Umkomaas. The family are truly an incredible team, who made everyone feel more than at home at their venue. And not forgetting the photographic genius that is Jacki Bruniquel!!!!! We of course expected world class photography from Jacki, but she has outdone herself with this event! Jacki your professionalism, mastery and sheer genius behind the lens leaves us breathless once again! And we could never forget the special couple! It was an honour to be a part of their special day and be the team that helped create such a happy memory for you both. No matter the hours or stress, kilometers walked and structures installed, the end result and seeing their dream wedding come true, is the reason we do what we do! But of course, we have to stand back, smile……and jump into the next project…..
We have now started manufacturing certain items in house, and first on the cards is our new 10 seater rectangular tables. These stunning tables will be launched in a gloss white and are perfect for wedding or corporate events. We will have pictures of these up on our Facebook page and website very soon…..so please check them out!! Functions for Africa have also been busy on the media and marketing front, hosting a client appreciation evening on the 28th July, as well as having a style shoot along with a “tips and tricks of florals” article which was published in the Ridge Magazine. Please check us out and see how these words of advice can assist you! We have also been kept busy on the concept front, and we are in the planning phase of what promises to be two of Durban’s most spectacular events…..so watch this space!!! Exciting events, new concepts and mind blowing themes will prevail! Please be sure to check out all our social media platforms. Our Facebook and Instagram feeds are always a buzz with our happenings, latest pics and events and references to our work. We hope to be a part of your next event…so never hesitate to contact us or pop into our showroom for coffee and a chinwag!! 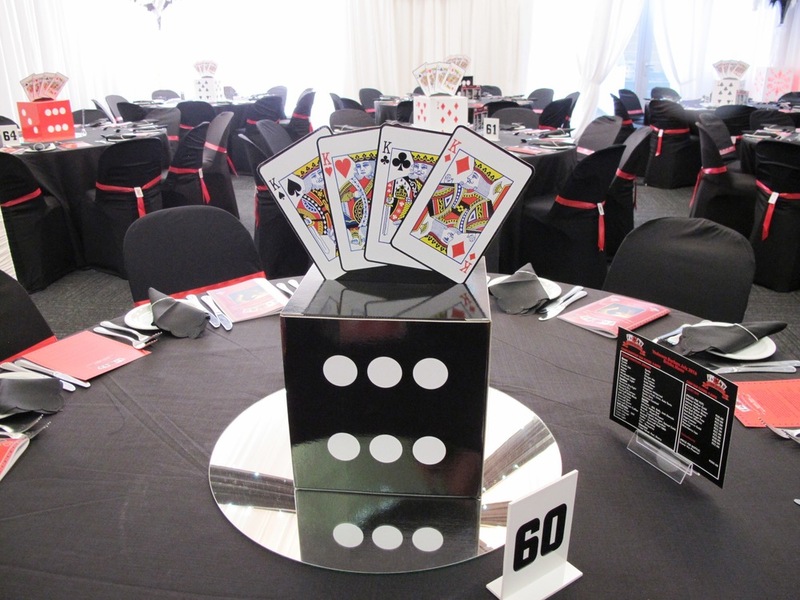 It’s action all the way at Greyville Racecourse as the style magicians work around the clock to turn dull empty spaces into sumptuous lounges, parlours, dining halls and party venues for the 2016 Vodacom Durban July. With just a day to go before Africa’s biggest and best horseracing event, the Functions for Africa team have only the finishing touches to make on the five venues they’ve decorated for the big day. 1. 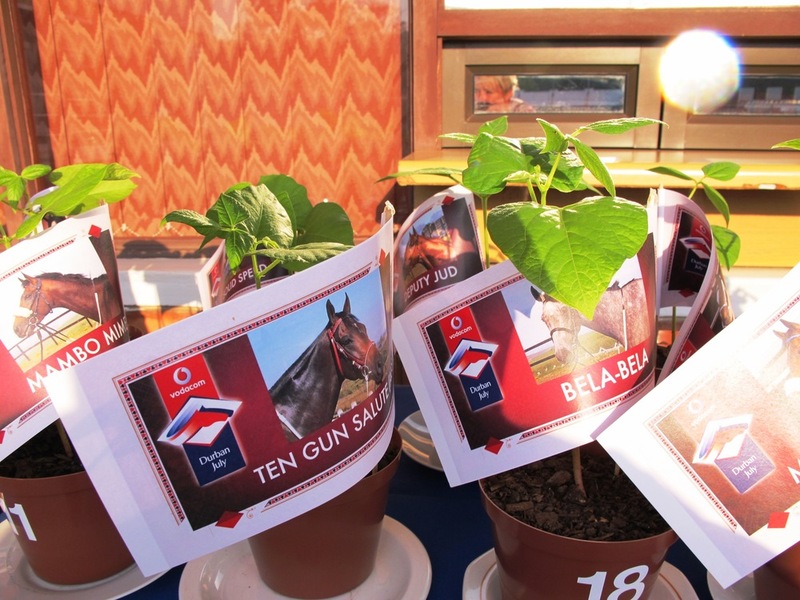 How long have you been involved in the Vodacom Durban July? 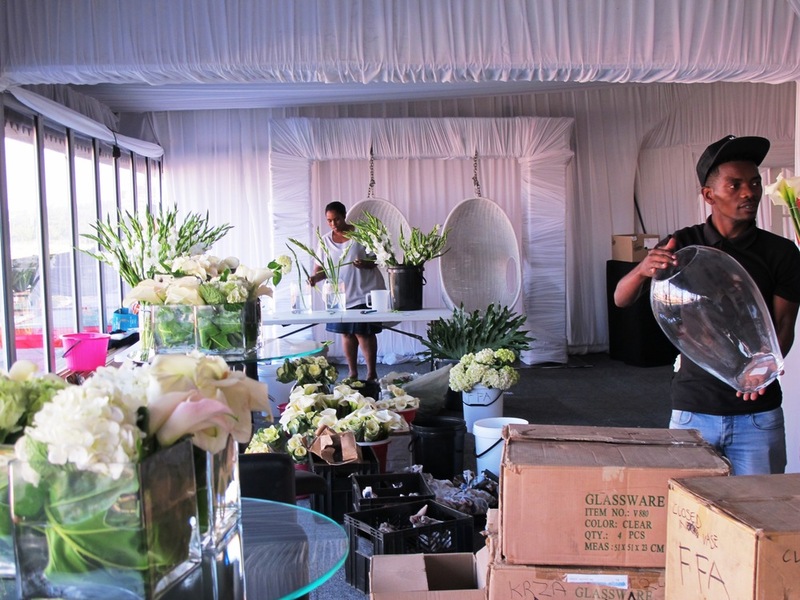 We’ve been working for various clients at the Durban July since 2002. 2. How have you seen the event evolve? Well, of course, the sponsor has changed dramatically, but it’s also attracting a much wider audience than before. The guests –especially in Tent Town -are a lot younger; it’s more sophisticated and also more corporate. And a lot more dressy. 3. 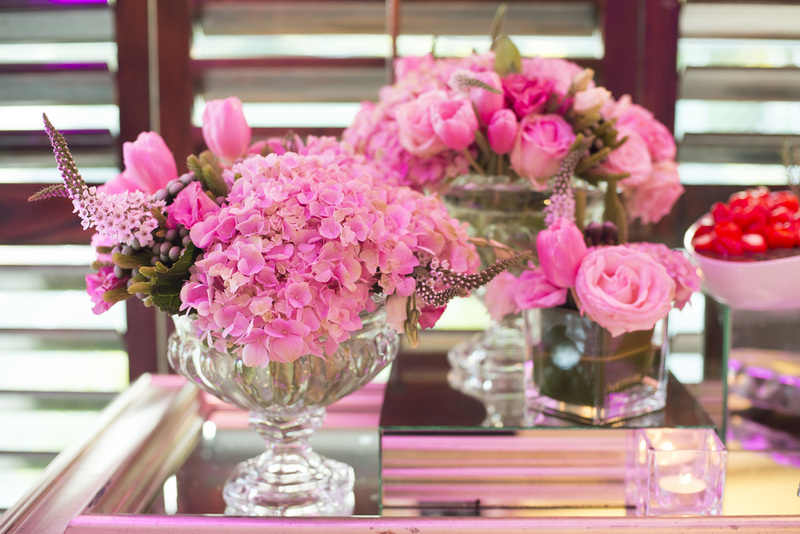 What are this year’s hot décor trends at Greyville? There’s more emphasis now on the cocktail lounge vibe, rather than the sit-down lunch. Glass, chrome, and clean, classic lines seem to be overtaking the more kitsch décor of days gone by. It’s definitely elegant rather than electric. 4. 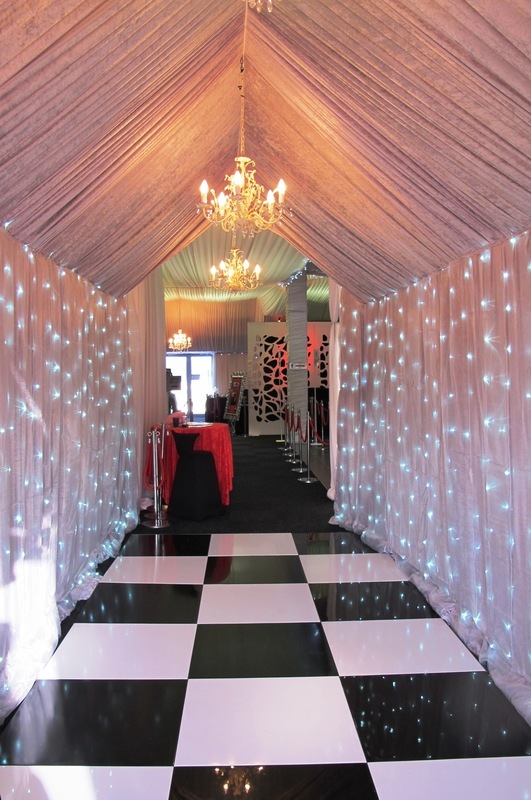 What have been some of your favourite clients/marquees at the July? Definitely Mercedes Benz, the SABC and Bloom Marketing. But we love our new client this year, Bophelo Life Insurance, who have allowed us free reign to use our signature style – lots of white draping, beautiful fresh flowers and classic lines. 5. How would you interpret this year’s theme – Leader of the Pack? Some people will go all out over the top on this one, but we prefer to keep it more subtle. For instance we’re only introducing it with vinyl stickers on the glass table tops at the Bophelo venue. 6. Have you ever had a major July disaster? Not us personally, but we have been involved with some nasty weather issues …most will remember a few years back when Tent Town turned into Sludge City following heavy rains. And there was also one year when a gale force wind blew up in the afternoon and we all had to scramble to hold everything down. Some tents even blew away. 7. Finally, what is your hot tip for the Big Race? I’m going with the grey filly Bela Bela and, on the fashion front, I strongly suggest that punters dress warmly, or they’ll have a very unpleasant day – baby, it’s going to be cold out there tomorrow! Recently we had the pleasure of working on a wonderful engagement party with Brigitte and Kyle, who are set to get married later this year, and decided to share their engagement with family and friends in a down to earth elegant affair at Brigitte’s father’s house. Functions for Africa worked quickly on a complementary concept for the space provided and sat with the amazingly talented Andrew Draper to work on a mouth-watering menu that would appeal to all and blow everyone’s taste buds away! On set-up day, in the outside area, the Nomadik was erected over the pool and entertainment area. Insane Sound and Lighting provided two Robe MMX’s which created the ambient lighting pattern. A multitude of LED parcans were setup throughout the house and gardens and created further ambience by means of colour washing the house. A choice was made to keep seating to a casual cocktail style, and we used our brand new, and very chic 8-seater cocktail servers, as well as glass cocktail tables and white leather barstools. Inside the house, we set up a graceful lounge area backed by the classy, yet funky laser-cut panels, custom made by Functions for Africa. Vintage crystal onion chandeliers were suspended over the mirror-top buffet stations framing their stylish elegance with contrasting coloured lighting. Keeping to the subtle tone, the flowers (done in house by Functions for Africa), were kept simple and elegant and provided just the right amount of colour and texture to the cocktail tables, coffee tables and buffet stations. And of course, no function of this caliber would be complete without candles….and lots of them! From coffee tables to entrance porticos and the large vases around the pool, the subtle, romantic candle light played an integral part in bringing out the elegant tone of this classy, modern affair. Upon arrival guests were greeted with delicious canapés and were thoroughly transfixed by the transformation of the house and entertainment areas. 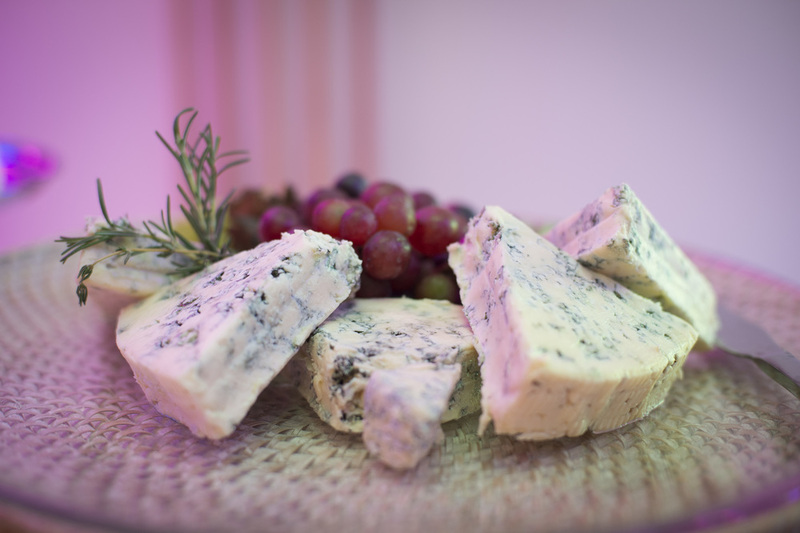 Fine food, drinks and music were thoroughly enjoyed until the early hours of the morning and we can be sure an absolutely magical evening was had by all. Ron, you are a true gentleman and a superb host. Once again, thank you to yourself, Brigitte and Kyle for bringing us on board and treating us like friends and family. We had an absolute blast doing this event for you and cannot wait for a wedding date to be set! To Brigitte and Kyle, congratulations again and we are sincerely looking forward to helping you put together your special day. Thank you Kym Burmester for the phenomenal pictures……..I am sure everyone will be able to get a sense of the wonderful evening.